Habitat's vision: a world where everyone has a decent place to live. Habitat partners with people in your community and all over the world, helping them build or improve a place they can call home. Working alongside volunteers, Habitat homeowners put in hundreds of “sweat-equity” hours as they help build their own homes. Homeowners then purchase their home and pay an affordable mortgage. There will be no work done at the Build site this weekend in preporation for the upcoming Easter Holiday. 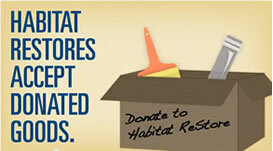 Though the ReStore will be open for those who still wish to volunteer and give back to their community. We here at Habitat for Humanity wish everyone a safe and happy Easter. Looking for affordable housing? Own your home, but need repairs? · Studies show that children living in owned homes have fewer behavioral problems than children whose parents rent housing. · Habitat family members become neighborhood leaders, serving in the PTA and community associations. · Habitat families are supported through establishing good credit, creating a family budget, purchasing insurance, paying taxes, maintaining property values and many other effective homeownership skills. We turn families who may not otherwise be able to afford a home of their own into proud homeowners. Habitat can also help current lower-income homeowners with critical home repairs that may be beyond their means. Zero interest loans for needed materials, repayment plans are based on actual ability to pay. 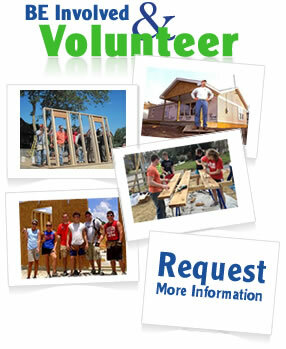 Sweat equity options are available in order to qualify toward partnering with Habitat volunteers in completing the repair project. Tasks continue toward completion of the home, including shelves and trim, exterior siding and more. Work will begin at 8:00 am until early afternoon, with a break for lunch about 11:30. We hope to be ready to paint the siding on the home this Saturday, weather permitting. 10-12 volunteers Showtime 8 am until finished. Larson Manufacturing is a valued, long-time provider of storm/screen doors to Habitat for Humanity, donating more than 3,000 units each year in the United States.